Brick Town Talk: Inspiration of the Day - 1/8/12 - LEGO Town, Architecture, Building Tips, Inspiration Ideas, and more! 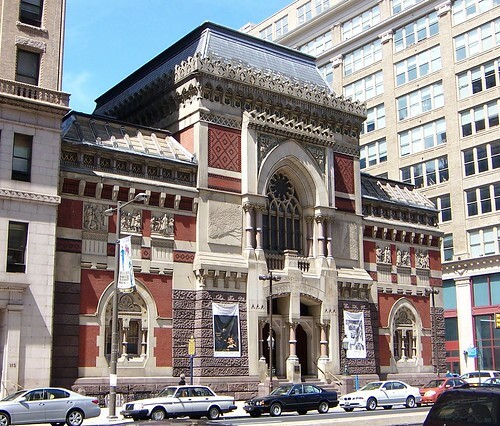 Philadelphia, Pennsylvania - (BTT) Known for his bold styles and creative use of materials, Philadelphia born architect Frank Furness was one of the more notable American architects following the Civil War. His competition winning design for the Pennsylvania Academy of the Fine Arts, completed in 1876, was one of many buildings in his city of birth - sadly, it is also one of the few still standing. Other gems, such as the magnificent Broad Street Station, have been demolished over the years, but thankfully some have escaped the wrecking ball. Influences from Furness live on in the work of one of his former draftsmen, Louis Sullivan, who is also known for his similar use of organic decorative elements.